It's been a great couple of days for Elon Musk. Tesla's stock is on fire. And SpaceX rockets, fortunately for Musk, are not. SpaceX launched a used rocket over the weekend and landed it successfully. So you can understand why Musk is apparently feeling a bit feisty. The stock surged 7% Monday to an all-time high on the news. Shares are up nearly 40% this year. As a result of this move, Tesla is now the second-most valuable auto company in America. Tesla surpassed Ford (F), which posted weak U.S. sales for March on Monday. Tesla is now within striking distance of passing GM (GM) in market value as well. Shares of GM also fell after its sales growth fell short of forecasts and its inventory levels spiked. The continued surge in Tesla is bad news for the fair number of short sellers -- investors who bet against a stock by borrowing the shares and selling it with the hopes that the price will fall so they can buy it back at the lower price and pocket the difference. Ihor Dusaniwsky, head of research for S3 Partners, a financial analytics firm, said in a report Monday that the stock pop caused Tesla bears to lose nearly $500 million on the stock on Monday alone -- and that they've lost $2.74 billion so far this year. Musk seems to be enjoying their pain. Musk tweeted some shade at Tesla (TSLA) detractors Monday after the electric car company reported solid first quarter sales on Sunday. He wrote to the more than 8 million followers of his verified Twitter account Monday afternoon that there must be "stormy weather in Shortville." That's an apparent nod to those who have lost money by being bearish on Tesla. Ouch. Is Musk hanging out too much with President Trump? That tweet seemed particularly brash and Trump-esque. Musk might want to be more careful. A tweet like this one could come back to haunt him if Tesla stumbles anytime soon. There are some analysts and investors who are worried about increased electric car competition from the likes of GM and Nissan (NSANF). Tech companies like Apple (AAPL), Google (GOOGL) and Uber could also be threats if they do more with driverless cars. There are also concerns about Tesla (and Musk) taking on too much risk with its recent SolarCity acquisition -- not to mention the fact that running SpaceX may distract Musk at a time when Tesla needs his attention as well. But Musk is having the last laugh for now. Even the "futuristic hyper-parody" Twitter account Bored Elon Musk, which has more than 1 million followers, is making light of those who have bet against Musk and Tesla. 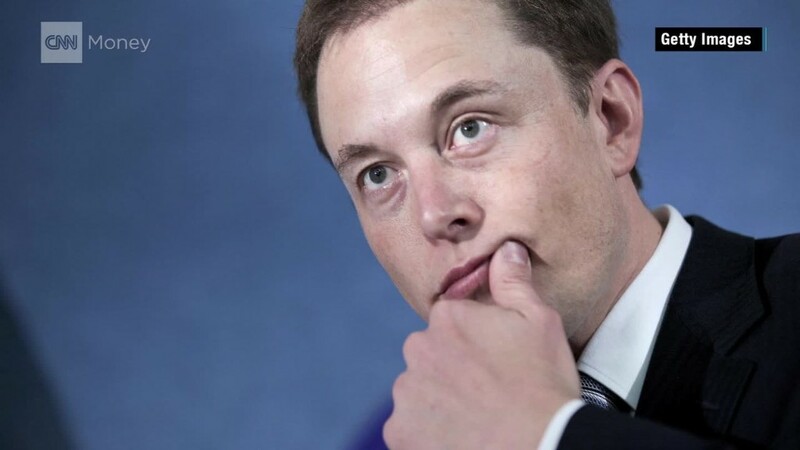 Bored Elon Musk tweeted on Monday that "if I had asked people what they wanted, they would have said faster gasoline vehicles." "If I had asked people what they wanted, they would have said faster gasoline vehicles." That's a reference to a quote that is often attributed to Henry Ford that referred to "faster horses" instead of "faster gasoline vehicles." There actually is no evidence that Ford actually ever said this though. But no matter. For now, it's good to be Elon Musk -- the real one or even the alter ego.